In the last years, different biotechnologically relevant microorganisms have been engineered for the synthesis of plant polyphenols such as flavonoids and stilbenes. However, low intracellular availability of malonyl-CoA as essential precursor for most plant polyphenols of interest is regarded as the decisive bottleneck preventing high product titers. In this study, Corynebacterium glutamicum, which emerged as promising cell factory for plant polyphenol production, was tailored by rational metabolic engineering towards providing significantly more malonyl-CoA for product synthesis. This was achieved by improving carbon source uptake, transcriptional deregulation of accBC and accD1 encoding the two subunits of the acetyl-CoA carboxylase (ACC), reduced flux into the tricarboxylic acid (TCA) cycle, and elimination of anaplerotic carboxylation of pyruvate. The constructed strains were used for the synthesis of the pharmacologically interesting plant pentaketide noreugenin, which is produced by plants such as Aloe arborescens from five molecules of malonyl-CoA. In this context, accumulation of the C1/C6 cyclized intermediate 1-(2,4,6-trihydroxyphenyl)butane-1,3-dione (TPBD) was observed, which could be fully cyclized to the bicyclic product noreugenin by acidification. The best strain C. glutamicum Nor2 C5 mufasOBCD1 PO6-iolT1 ∆pyc allowed for synthesis of 53.32 mg/L (0.278 mM) noreugenin in CGXII medium supplemented with casamino acids within 24 h.
Besides alkaloids and isoprenoids, polyphenols constitute the third large group of plant secondary metabolites . In plants, polyphenols such as flavonoids, stilbenes or lignans do not contribute directly to growth or propagation, they rather protect the plant from UV radiation, aid in the defense against pathogens or herbivores, and color petals and fruits to attract animals [2, 3]. Due to anti-oxidative, anti-depressive, anti-hepatotoxic, anti-cancerous as well anti-inflammatory effects described for many polyphenols, these compounds received a lot of attention over the last years [4–8]. Recently, the Gram-positive soil bacterium Corynebacterium glutamicum was engineered towards plant polyphenols synthesis [9, 10]. Important prerequisite for establishing C. glutamicum as polyphenol producing cell factory was the identification and abolishment of a catabolic phenylpropanoid pathway. To date, several stilbenes (e.g. resveratrol and its O-methylated derivatives) as well as flavonoids (e.g. naringenin, kaempferol and quercetin) could be produced with C. glutamicum from supplemented phenylpropanoid precursors or directly from glucose [10, 11]. In the context of these studies, low intracellular availability of malonyl-CoA provided by the central metabolism could be identified as major bottleneck impeding higher product titers . When considering the stoichiometry of flavonoid and stilbene synthesis, however, the importance of larger amounts of malonyl-CoA for plant polyphenol synthesis is not surprising as three moles of malonyl-CoA are consumed by chalcone synthases (CHS) and stilbene synthases (STS) during condensation with a CoA-activated phenylpropanoid thioester yielding chalcones (as flavonoid precursors) and stilbenes, respectively . Similar to engineered polyphenol production in other microorganisms, the observed limitation at the stage of malonyl-CoA could be overcome in C. glutamicum at lab-scale by supplementing the antibiotic cerulenin, which selectively inhibits fatty acid synthesis as main malonyl-CoA sink in the microbial carbon metabolism [10, 13, 14]. Very recently, dependency on cerulenin for plant polyphenol synthesis could be repealed by rationally engineering the central metabolism yielding the C. glutamicum C7 strain, which enabled the accumulation of 24 mg/L (0.088 mM) naringenin or 112 mg/L (0.49 mM) resveratrol from glucose . Key to success was a reduction of the flux into the tricarboxylic acid (TCA) cycle, whereas episomal overexpression of accBC (cg0802) and accD1 (cg0812) encoding the two subunits of the acetyl-CoA carboxylase complex (ACC) hardly increased product titers. In C. glutamicum, transcription of accBC and accD1 is controlled by the transcriptional repressor FasR . Hence, fasR (cg2737) was also deleted to deregulate expression of accBC and accD1, but the observed positive effect on malonyl-CoA availability and accumulation of the flavonoid naringenin was very limited . This was explained by the previous finding that FasR also represses expression of fas-IA (cg2743) and fas-IB (cg0957) coding for the two fatty acid synthases of C. glutamicum, which consume malonyl-CoA provided by the ACC for fatty acid biosynthesis . About a decade ago, the pentaketide chromone synthase (PCSAa, EC 2.3.1.216, UniProt ID: Q58VP7) was identified in the medicinal plant Aloe arborescens . Like CHS- and STS-enzymes, PCSAa is a type III polyketide synthase (PKS), but instead of catalyzing the condensation of three malonyl-CoA extender units with a CoA-activated phenylpropanoid thioester, this enzyme catalyzes the iterative decarboxylation and condensation of five malonyl-CoA molecules yielding the chromone noreugenin (Fig. 1). Plant-derived chromones such as noreugenin are gaining attention drawn by their beneficial impacts on human health including anti-inflammatory, anti-cancerous, anti-diabetic but also antimicrobial traits . Thus, the chromone scaffold is considered to be a promising lead structure for medicinal chemistry. Noteworthy, the furochromones khellin and visnagin, both regarded to have anti-asthmatic effects, are derived from the pentaketide noreugenin . Chemical routes for the synthesis of noreugenin include acid- or base-catalyzed reactions, microwave irradiation and solid-support catalysts [20, 21]. In addition to chemical synthesis, noreugenin could also be obtained by extraction from the producing plant material. However, typically, chemical synthesis of more complex secondary plant metabolites is economically not feasible and product concentrations in the naturally producing plants are usually quite low. In this context, microbial production of secondary plant metabolites has emerged as true alternative . In case of noreugenin, synthesis of this compound has been first described in in vitro enzyme assays with purified PCSAa . Recently, microbial noreugenin synthesis in Escherichia coli using PCSAa has been reported for the first time as proof of principle, but no product titer was determined . 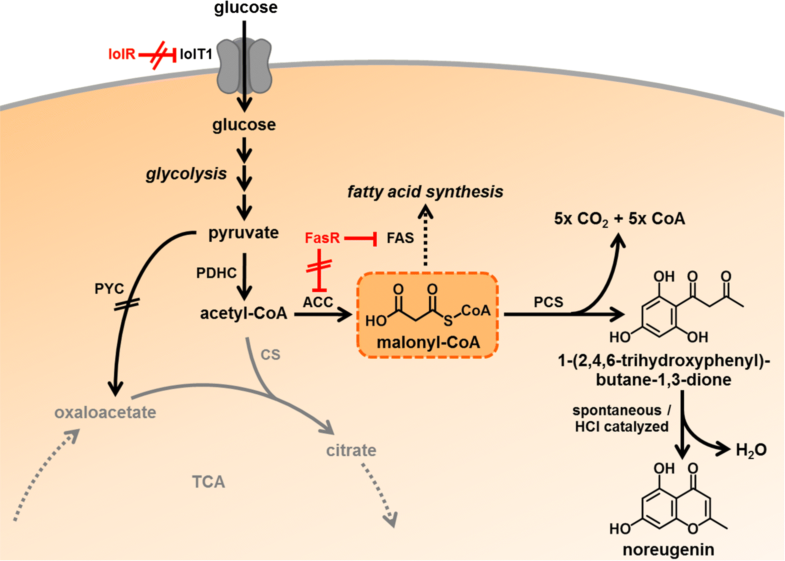 Here, we present rational engineering of the central carbon metabolism and of fatty acid synthesis in C. glutamicum towards further increasing malonyl-CoA availability. Furthermore, we demonstrate the functional integration of PCSAa into these engineered C. glutamicum strains and the microbial synthesis of noreugenin. For establishing noreugenin synthesis in C. glutamicum, a codon-optimized, synthetic variant of the pcs gene (pcsAaCg) originating from A. arborescens was cloned into the vector pMKEx2 yielding pMKEx2-pcsAaCg, which allows for isopropyl β-d-thiogalactopyranoside (IPTG) inducible gene expression of pcsAaCg from the strong T7 promoter . After transformation of C. glutamicum C7 selected as production strain due to its improved capability to supply malonyl-CoA, the resulting strain C. glutamicum C7 pMKEx2-pcsAaCg (designated C. glutamicum Nor1 C7) was cultivated in defined CGXII minimal medium with 4% glucose and 1 mM IPTG. However, these initial experiments yielded only traces of noreugenin close to the detection limit of our LC–MS system (Fig. 2). Detailed comparison of the amino acid sequence of PCSAa to similar type III PKS such as the STS from Arachis hypogea (STSAh) and CHS from Petunia x hybrida (CHSPh) revealed that the first ten amino acids of PCSAa have no equivalent sequence in any of the two other enzymes, despite their otherwise high sequence identity of 70–80% over the whole amino acid sequence (Additional file 1: Figure S1). Surprisingly, residues M11 and V14 of PCSAa align with the starting methionine M1 and V4 of both enzymes, CHSPh and STSAh. This pointed either to a simple misannotation of the translational start or to the ten N-terminal amino acids of PCSAa functioning as signal sequence for protein localization in the plant cell. Three algorithms (SignalP , TargetP  and WoLF PSORT ) developed to detect signal- and targeting peptide sequences were used to interpret this sequence, but none proposed a possible function for this short amino acid stretch. However, a pMKEx2 plasmid harboring a truncated pcsAaCg variant (pcsAaCg-short, pMKEx2-pcsAaCg-short) without the first 30 nucleotides encoding the ten N-terminal amino acids in question was constructed. Expression of the truncated pcsAaCg gene in the strain C. glutamicum C7 (designated C. glutamicum Nor2 C7) under aforementioned conditions, significantly improved noreugenin synthesis leading to a product titer of 0.8 mg/L (0.004 mM) after 72 h (Fig. 2). Hence, most likely the pcsAa was simply not annotated correctly, likely reducing the activity of the enzyme or preventing the formation of the active PCSAa dimer under the described conditions. In order to further improve noreugenin synthesis, fatty acid metabolism of C. glutamicum Nor2 C7 was engineered aiming for increased malonyl-CoA supply. The fatty acid regulator protein FasR acts as transcriptional repressor of the genes accBC, accD1, fasIA and fasIB, all involved in fatty acid biosynthesis . Deletion of fasR in C. glutamicum C7 was shown to negatively affect flavonoid synthesis, presumably due to an also increased fatty acid synthase (FAS) activity consuming malonyl-CoA again . In contrast, episomal overexpression of ACC subunit genes accBC and accD1 increased the polyphenol production by 40%, which shows that acetyl-CoA carboxylation is indeed a promising target for further metabolic engineering. Therefore, fatty acid metabolism of C. glutamicum should be tailored towards increased endogenous ACC activity yielding more malonyl-CoA without simultaneously increasing FAS activity consuming this noreugenin precursor. Mutational analysis of the operator regions of both acc genes identified the fasO motifs essential for FasR binding . Based on these findings, the fasO motifs upstream of the accBC- and accD1- open reading frames were mutated in the C. glutamicum C7 strain background, both individually (mufasOBC, mufasOD1) and in combination (mufasOBCD1). Important to note in this context, since the FasR binding site of accD1 overlaps with the open reading frame of this gene, only nucleotide substitutions were introduced that do not alter the amino acid sequence of AccD1 (Fig. 3). Subsequently, the resulting strains C. glutamicum Nor2 C7 mufasOBC, C. glutamicum Nor2 C7 mufasOD1 and C. glutamicum Nor2 C7 mufasOBCD1 were cultivated to compare their ability to produce noreugenin (Fig. 2). Whereas the strains with individually mutated fasO sites accumulated 0.31 mg/L (0.002 mM) and 0.06 mg/L (0.0003 mM), respectively, did C. glutamicum Nor2 C7 mufasOBCD1 generate 1.98 mg/L (0.010 mM) noreugenin after 72 h of cultivation in CGXII medium with 4% glucose. 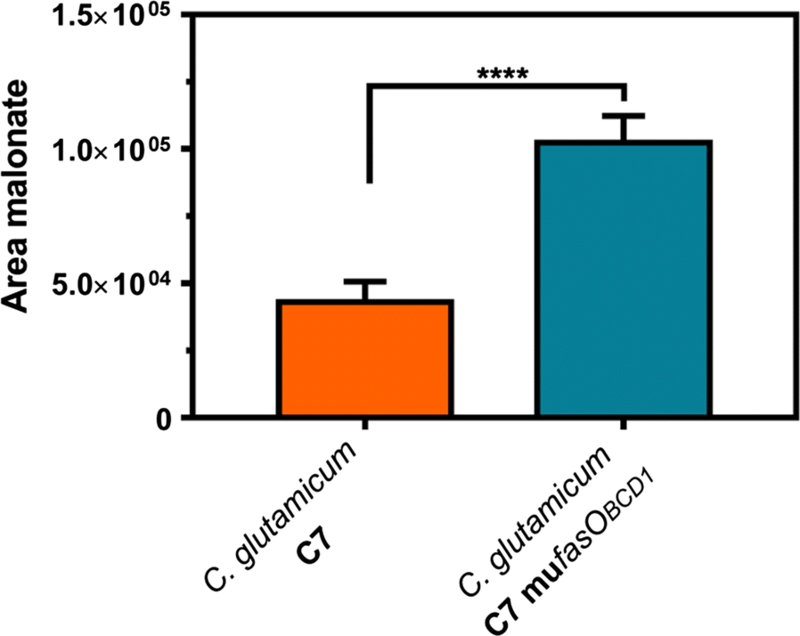 With the aim of verifying that C. glutamicum C7 mufasOBCD1 indeed provides more malonyl-CoA compared to C. glutamicum C7, intracellular malonyl-CoA was quantified in form of its free acid malonate by LC–MS/MS as previously described . As the expression of pcsAaCg-short would lead to malonyl-CoA consumption and thus distort intracellular metabolite concentrations, the strains without the pMKEx2-pcsAaCg-short plasmid were examined. Since the obtained isotope ratio for the parental C. glutamicum C7 strain was below the limit of quantification, obtained signal areas themselves were used for comparison (Fig. 4). The malonate area for the parental strain C. glutamicum C7 was determined to be 43,065 ± 3090, whereas the malonate signal for C. glutamicum C7 mufasOBCD1 was increased 2.8-fold (102,304 ± 4495). As the isotope ratio corresponding to the latter area was within the linear range of the calibration curve, an intracellular malonate concentration of 1.8 mM for C. glutamicum C7 mufasOBCD1 could be calculated. These findings show that noreugenin synthesis can be used to quickly report differences in intracellular malonyl-CoA pools of constructed C. glutamicum strains, instead of always using the laborious LC–MS/MS-based method. This allows considering noreugenin as a reliable reporter molecule to evaluate the impact of metabolic engineering on intracellular malonyl-CoA availability in addition to the relevance of the product itself. Previously, reduction of the activity of citrate synthase (CS, encoded by the gene gltA, cg0949) to 10% compared to wild-type CS activity by promoter replacement enabled increased plant polyphenol production with C. glutamicum due to a reduced flux of acetyl-CoA in the TCA cycle and thus increased malonyl-CoA availability . Further reduction of CS activity to 5.5% was achieved by exchanging the PdapA-C7 promoter upstream of gltA by the even weaker PdapA-C5 variant [15, 28]. The constructed strain C. glutamicum Nor2 C5 mufasOBCD1 showed reduced growth, but accumulated two times more noreugenin after 72 h of cultivation (4.13 mg/L, 0.022 mM) compared to C. glutamicum Nor2 C7 mufasOBCD1 (1.98 mg/L, 0.010 mM, Fig. 2). The dependency of noreugenin synthesis on the availability of the glucose-derived metabolite malonyl-CoA suggests that an improved glucose uptake of C. glutamicum might further increase the intracellular malonyl-CoA pool. Recently, we reported that relieve of IolR-mediated repression of the iolT1 gene encoding the glucose/myo-inositol permease IolT1 by promoter engineering increases d-xylose and d-glucose uptake in C. glutamicum [29, 30]. Hence, two point mutations in the iolT1 promoter (PO6-iolT1) were also introduced into C. glutamicum Nor2 C5 mufasOBCD1 yielding C. glutamicum Nor2 C5 mufasOBCD1 PO6-iolT1. Interestingly, this modification appears to have only a minor positive effect on noreugenin synthesis (4.40 mg/L, 0023 mM, Fig. 2), but growth, negatively influenced by downregulation of gltA expression, was partly improved. To further increase acetyl-CoA availability for malonyl-CoA synthesis, anaplerotic reactions withdrawing phosphoenolpyruvate (PEP) and pyruvate as glycolytic acetyl-CoA precursors were targeted. Interestingly, C. glutamicum is capable of catalyzing the carboxylation of both PEP and pyruvate during growth on glucose, which is rather uncommon for most microorganisms . It was demonstrated, that PEP carboxylase (PEPC) and pyruvate carboxylase (PYC) could replace each other as anaplerotic enzymes when glucose is used as sole carbon and energy source . This means that at least one of the two enzymes needs to be present for enabling growth on glucose. In fact, 90% of total oxaloacetate synthesis is ascribed to the activity of PYC encoded by pyc (cg0791) in C. glutamicum . Therefore, we decided to delete pyc. The strain C. glutamicum Nor2 C5 mufasOBCD1 PO6-iolT1 ∆pyc was constructed, cultivated and characterized with regard to noreugenin synthesis. Deletion of the pyc gene in this strain increased noreugenin synthesis and enabled accumulation of 5.63 mg/L (0.029 mM) noreugenin within 72 h (Fig. 2). 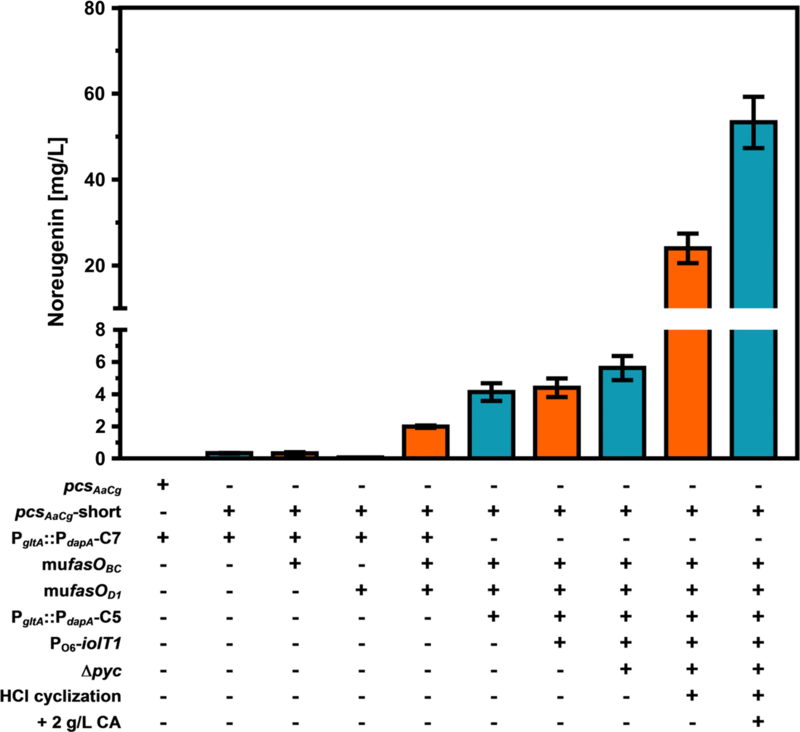 To our surprise, synthesis of noreugenin continued over the whole process time in all C. glutamicum strains constructed in this study, although the cells reached the stationary growth phase already after 24 h. To the best of our knowledge, malonyl-CoA supply in C. glutamicum is strictly coupled to the exponential growth phase, implying that noreugenin synthesis should cease when the cultures reach the stationary growth phase. In preceding studies focusing on the synthesis of malonyl-CoA-dependent polyphenols naringenin and resveratrol with C. glutamicum C7-based strains, continuous production of the respective polyphenols was never observed . Even when prolonging the cultivation times from 72 to 192 h, noreugenin formation continued and did not reach a plateau (Additional file 1: Figure S2). We assumed that this phenomenon was unlikely to be due to the engineered C. glutamicum strain background, instead we concluded that the reason for this finding must be connected to the product noreugenin itself. As noreugenin synthesis from malonyl-CoA is catalyzed by a single enzyme, further investigations focused on PCSAa and its reaction mechanism. PCSAa is described to catalyze a C1/C6 Claisen-type cyclization of the enzyme-bound pentaketide followed by spontaneous pyrone ring formation yielding noreugenin . In silico reconstruction of the PCSAa reaction mechanism suggested 1-(2,4,6-trihydroxyphenyl)butane-1,3-dione (TPBD, M = 210,05 g/mol) to be the C1/C6 cyclized pentaketide intermediate that subsequently undergoes spontaneous isomerization and dehydration (Fig. 1). When the mass spectrometer was operated in negative electrospray ionization (ESI) mode and data acquisition was performed in selected ion monitoring (SIM) mode, an additional mass signal at m/z 209 (retention time = 1.33 min) was detected in all prepared samples representing the [M−H]− mass signal for the presumed intermediate TPBD (Fig. 5a). Over the cultivation time, a decreasing TPBD signal could be observed whereas the noreugenin signal increased (Fig. 5b). Unfortunately, unavailability of an authentic TPBD standard rendered quantification of this intermediate impossible. To evaluate product formation over time, we added up the signal areas of TPBD and noreugenin, both normalized to the area of the internal standard benzoic acid ((AreaNoreugenin/AreaBenzoic acid) + (AreaTPBD/AreaBenzoic acid)) (Fig. 5c). Here, no net change of summed ratios beyond 24 h of cultivation could be observed. We concluded, that the synthesized TPBD circularizes spontaneously after this time point, forming the pyrone moiety yielding noreugenin. This would explain the observed decreasing TPBD concentration and an increasing noreugenin concentration over time. However, since the summed ratio of TPBD and noreugenin does not change after 24 h, no more TPBD is synthesized when the cells have reached the stationary growth phase and malonyl-CoA supply stopped after 24 h when glucose is depleted. Therefore, the observed continuous noreugenin synthesis can solely be ascribed to slow, spontaneous TPBD conversion and is not due to any unlikely growth-decoupled supply of malonyl-CoA. 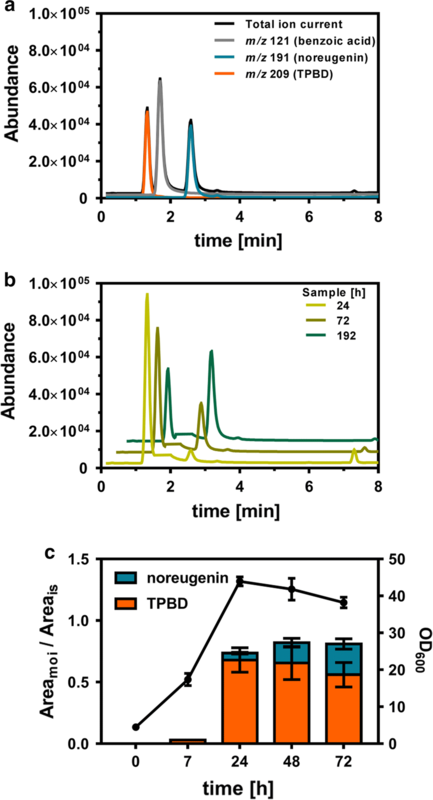 As the slow, spontaneous cyclization of the pyrone moiety limits the absolute noreugenin titer and needlessly prolongs the overall process time, speeding up TPBD conversion was targeted to fully convert TPBD to noreugenin. For this purpose, acetonitrile extracts prepared for LC–MS analysis were acidified with methanolic HCl at various concentrations. After evaporation to dryness and subsequent resuspension in acetonitrile, conversion of TPBD to noreugenin was quantified using LC–MS analysis. These experiments showed, that a concentration of at least 142 mM HCl was required to achieve full conversion of TPBD to noreugenin (data not shown). Here, we proposed an acid-catalyzed mechanism for the cyclization of TPBD (Additional file 1: Figure S3). Application of this method for samples obtained from standard cultivation of the best performing strain C. glutamicum Nor2 C5 mufasOBCD1 PO6-iolT1 ∆pyc increased the total noreugenin titer to 23.99 mg/L (0.125 mM, Fig. 2). Recently, standard CGXII medium was described to be insufficient to support heterologous expression of the plant-derived genes ans and 3gt encoding an anthocyanidin synthase and an anthocyanidin 3-O-glucosyltransferase required for anthocyanin biosynthesis in C. glutamicum . In this context, utilization of Andrew’s magic medium (AMM), described as a rich medium for E. coli already containing 2 g/L casamino acids, was tested . Additional supplementation of 2 g/L casamino acids for improving the functional expression of these genes allowed for higher anthocyanin titers with C. glutamicum from supplemented catechin. With the aim to exclude that microbial noreugenin synthesis with C. glutamicum Nor2 C5 mufasOBCD1 PO6-iolT1 ∆pyc suffers from poor expression of pcsAaCg-short due to an unfavorable medium composition, standard CGXII medium with 4% glucose was additionally supplemented with 2 g/L casamino acids. By doing so, noreugenin synthesis could be doubled yielding 53.32 mg/L (0.278 mM) after 72 h of cultivation and subsequent HCl-based cyclization of the TPBD intermediate (Fig. 2). In this study, we describe engineering of C. glutamicum for increased malonyl-CoA availability and microbial synthesis of the plant pentaketide noreugenin originally found in the medicinal plant A. arborescens. Key to success was the N-terminal truncation of the type III PKS enabling noreugenin synthesis. Originally, the ten N-terminal residues of PCSAa were believed to contribute to the formation of an expanded surface-exposed loop . However, since this short amino acid stretch is not present in closely related CHS- and STS-enzymes, which could be already functionally implemented in C. glutamicum, we deleted the first 30 nucleotides of the pcsAa gene. Eventually, this modification drastically improved noreugenin synthesis. A common approach in the context of improving malonyl-CoA availability for product synthesis aims at increasing ACC activity in the respective microbial workhorse . Previously, by abolishing Snf1-dependent posttranslational regulation of Acc1, malonyl-CoA availability in Saccharomyces cerevisiae could be increased for the synthesis of fatty acid ethyl esters and 3-hydroxypropionic acid . Another strategy for increasing ACC activity is overexpression of genes encoding for the respective subunits of this enzyme complex. For example, episomal overexpression of four genes coding for a heterotetrameric ACC from Photorhabdus luminescens in E. coli increased the titer of the malonyl-CoA-derived polyphenol pinocembrin sevenfold, yielding 196 mg/L of this product . Furthermore, the active AccBC-AccD1 heterodimer of C. glutamicum could be functionally introduced into E. coli . By following this strategy, the intracellular malonyl-CoA availability in E. coli was increased 15-fold allowing for the synthesis of 1.3 g/L phloroglucinol . In this study, we developed a different strategy aiming for an increased expression of the genomically encoded ACC genes in C. glutamicum, instead of following the more traditional approach of episomal overexpression of (heterologous) genes. By mutation of the fasO-sites upstream of accBC and accD1, repression of gene expression mediated by the transcription regulator FasR could be repealed, which almost tripled intracellular malonyl-CoA availability and thus enabled increased product formation. Important to note, mutation of both FasR binding sites was required to increase ACC activity, probably because a functional ACC requires both subunits, AccBC and AccD1, in equimolar amounts [39, 41]. Furthermore, the intracellular malonyl-CoA availability was positively influenced by increasing glucose uptake through deregulation of the gene for the glucose/myo-inositol permease IolT1. However, this had only limited beneficial effects on noreugenin synthesis at shaking flask scale, but might be beneficial for large-scale applications when considering important process criteria such as space–time yield. Efficacy of this strain modification was already demonstrated for the de novo synthesis of hydroxybenzoic acids in C. glutamicum from glucose . Potential other strategies for increasing the intracellular malonyl-CoA availability include establishing an ACC-independent pathway for malonyl-CoA synthesis from supplied malonate through heterologous expression of genes for malonate uptake and CoA-activation of malonate originating from the malonate assimilation pathway in Rhizobium trifolii . This particular approach enabled a 15-fold increase of pinocembrin production using E. coli [13, 43]. Furthermore, state-of-the-art techniques for gene silencing or downregulation such as CRISPR interference (CRISPRi) or methods employing synthetic small regulatory RNA (sRNA) libraries or synthetic antisense RNA (asRNA) could be used to specifically knock down genes encoding for malonyl-CoA consuming enzymes [23, 44, 45]. Moreover, we predicted and detected the TPBD intermediate as the actual product of PCSAa and could show that formation of TPBD is strictly limited to the exponential growth phase in C. glutamicum in which malonyl-CoA is exclusively supplied. This is in line with our observations regarding flavonoid- and stilbene synthesis with C. glutamicum [10, 15]. Through HCl acidification of acetonitrile extracts we achieved full conversion of TPBD to noreugenin within 3 h allowing to significantly reduce the overall cultivation time. Very recently, it could be demonstrated that composition of the defined CGXII medium might not be optimal for the expression of plant-derived genes involved in anthocyanin synthesis in C. glutamicum . In this particular study, supplementation of the defined AMM medium with 2 g/L casamino acids significantly improved heterologous gene expression and thus anthocyanin synthesis. Casamino acids, obtained through acid hydrolysis of casein, represent a valuable source of all proteinogenic amino acids except tryptophan [46, 47]. Although it could be shown here that supplementation of casamino acids also promotes noreugenin synthesis, we prefer the simplicity of defined CGXII medium, especially as the composition of casamino acids varies from supplier to supplier. Nevertheless, this supplementation strategy is helpful to meet possible future challenges connected to heterologous gene expression. Alternatively, translational fusions of the target protein with the maltose-binding protein MalE from E. coli can be generated. This strategy already proved to be beneficial for the functional expression of a plant-derived O-methyltransferase gene from Vitis vinifera in C. glutamicum . 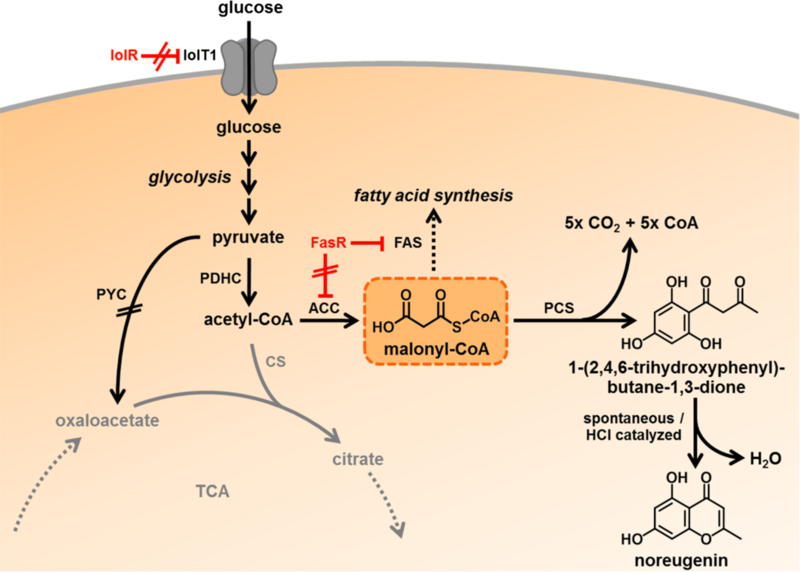 In the present work, we applied the knowledge of the well-characterized central carbon metabolism to tailor C. glutamicum towards increased malonyl-CoA availability by rational metabolic engineering. Additionally, our work contributes to a better understanding of the PCSAa reaction mechanism as we could detect the intermediate TPBD, which spontaneously cyclizes to noreugenin. Acidification accelerated TPBD conversion to the product allowing for a titer of 53.32 mg/L (0.278 mM) noreugenin. Taken together, the constructed strain C. glutamicum C5 mufasOBCD1 PO6-iolT1 ∆pyc represents a promising strain for the microbial production of noreugenin and other malonyl-CoA derived products. All bacterial strains and plasmids with their respective characteristics used in this study are listed in Table 1. C. glutamicum strains were routinely cultivated aerobically at 30 °C in brain heart infusion (BHI) medium (Difco Laboratories, Detroit, USA) or defined CGXII medium with glucose as sole carbon and energy source . When indicated, 2 g/L casamino acids were supplemented (Becton–Dickinson, Franklin Lakes, USA). E. coli DH5α was used for plasmid constructions and was cultivated in LB medium  at 37 °C. Where appropriate, kanamycin (E. coli 50 µg/mL, C. glutamicum 25 µg/mL) was added to the medium. Bacterial growth was followed by measuring the optical density at 600 nm (OD600). To cultivate C. glutamicum, a test tube with 5 mL BHI medium was inoculated with a single colony from an agar plate and grown for 6–8 h on a rotary shaker at 170 rpm (first preculture). This first preculture was used to inoculate 50 mL of defined CGXII medium with 4% glucose in a 500 mL baffled Erlenmeyer flask (second preculture). The second preculture was cultivated overnight on a rotary shaker at 130 rpm. The main culture was subsequently inoculated from the second preculture to an OD600 of 5 in defined CGXII medium with 4% glucose. For synthesis of noreugenin, heterologous gene expression was induced 90 min after inoculation of the main culture using 1 mM IPTG. 1 mL of the culture broth was sampled at defined time points and stored at − 20 °C until ethyl acetate extraction and LC–MS analysis. Standard protocols of molecular cloning, such as PCR, restriction and ligation of DNA were carried out for recombinant DNA work . All enzymes were obtained from Thermo Fisher Scientific (Schwerte, Germany). Codon-optimized synthetic genes for C. glutamicum ATCC13032 were obtained from Life Technologies (Darmstadt, Germany). Genes and chromosomal fragments were amplified by PCR from synthetic genes or genomic C. glutamicum DNA as template using the listed oligonucleotides (Table 2). PCR products were subsequently used for cloning of genes and genomic fragments into plasmid vectors using Gibson Assembly . In-frame gene deletions and introduction of genomic mutations in C. glutamicum were performed using the pK19mobsacB system  by a two-step homologous recombination method described previously . Integrity of all constructed plasmids was verified by colony PCR, restriction analysis, and DNA sequencing at Eurofins MWG Operon (Ebersberg, Germany) Techniques specific for C. glutamicum, e.g. electroporation of cells, were performed as described previously . Noreugenin extraction was performed by mixing 1 mL of the culture broth with 1 mL ethyl acetate and subsequent vigorous shaking (1400 rpm, 10 min, 20 °C) in a thermomixer (Eppendorf, Hamburg, Germany). The suspension was centrifuged for 5 min at 13,300 rpm and the upper, organic layer (800 µL) was transferred to an organic solvent resistant deep-well plate (Eppendorf, Hamburg, Germany). After evaporation of the ethyl acetate overnight, the same volume of acetonitrile was used to resuspend the dried extracts for LC–MS analysis. Noreugenin was quantified using an Agilent ultra-high-performance LC (uHPLC) 1290 Infinity System coupled to a 6130 Quadrupole LC–MS System (Agilent Technologies, Waldbronn, Germany). LC separation was carried out with a Kinetex 1.7 µm C18 100 Å pore size column (2.1 * 50 mm; Phenomenex, Torrance, CA, USA) at 50 °C. For elution, 0.1% acetic acid (solvent A) and acetonitrile supplemented with 0.1% acetic acid (solvent B) were applied as the mobile phases at a flow rate of 0.5 mL/min. A gradient elution was used, where the amount of solvent B was increased stepwise: minute 0 to 6: 10% to 30%, minute 6 to 7: 30% to 50%, minute 7 to 8: 50% to 100% and minute 8 to 8.5: 100% to 10%. The mass spectrometer was operated in the negative electrospray ionization (ESI) mode, and data were acquired using the selected ion monitoring (SIM) mode. An authentic noreugenin standard was purchased from Carbosynth (Compton, Newbury, United Kingdom). Area values for [M−H]− mass signals were linear up to metabolite concentrations of at least 50 mg/L. Benzoic acid (final concentration 100 mg/L) was used as internal standard. A calibration curve was calculated based on analyte/internal standard ratios for the obtained area values. For the cyclization of 1-(2,4,6-trihydroxyphenyl)butane-1,3-dione, a 250 µL aliquot of the ethyl acetate-extracted acetonitrile samples prepared for LC–MS was acidified by addition of 100 µL 0.5 M HCl in MeOH (final concentration 0.15 M). The samples were incubated (700 rpm, 3 h, 50 °C) in a thermomixer (Eppendorf, Hamburg, Germany), evaporated to dryness and subsequently resuspended in 250 µL acetonitrile. LC–MS analysis of obtained samples was performed as described above. LM and NK conceived the design of this study. LM performed the construction of plasmids and strains, cultivation, sample preparation and analysis. JK performed the experiments for the determination of the intracellular malonyl-CoA availability. LM, NK and JM wrote the manuscript. All authors read and approved the final manuscript. We would like to thank Prof. Dr. Jörg Pietruszka and Julian Greb (both Institute of Bioorganic Chemistry, Heinrich Heine University of Düsseldorf at Forschungszentrum Jülich GmbH) for helpful advice regarding the acid-catalyzed cyclization of TPBD. Furthermore, we are grateful for the plasmid pK19mobsacB-PgltA::PdapA-C5 provided by Dr. Tino Polen (Institute of Bio- and Geosciences, IBG-1: Biotechnology, Forschungszentrum Jülich GmbH). This work was funded by the Bioeconomy Science Center (BioSC) as part of the FocusLab project “HyImPAct-Hybrid processes for important precursor and active pharmaceutical ingredients” (Grant no. : 325 - 400 002 13). JK received Funding from the Enabling Spaces Program “Helmholtz Innovation Labs” of the German Helmholtz Association to support the “Microbial Bioprocess Lab—A Helmholtz Innovation Lab”. 12934_2019_1117_MOESM1_ESM.pdf Additional file 1. Additional information containing detailed alignment of amino acid sequences, further results and a proposed mechanism for the acid-catalyzed cyclization of TPBD.